University of North Carolina contacted us to relay that the animal lab would be ending and that the school would only be using human-relevant methods to train emergency medicine residents! 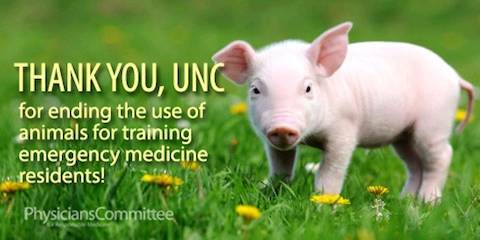 Physicians Committee launched a public campaign against the University of North Carolina (UNC) last August by filing a federal complaint after the school failed to consider implementing exclusively nonanimal training methods. Local physicians joined us in asking the U.S. Department of Agriculture to investigate the university's animal use, which included practicing numerous invasive procedures on live pigs to teach emergency medicine residents. In October, UNC's Student Animal Legal Defense Fund hosted a lecture by our director of research advocacy, Ryan Merkley, who presented arguments in favor of human-relevant training methods. Last month, our local physician advocate, Roberta Gray, M.D., submitted public comments to the UNC Board of Governors, urging her alma mater to modernize their emergency medicine residency program so that it would meet the standard of excellence for which the university is known. Meanwhile, students and local activists rallied in support of our efforts by distributing outreach materials and educating the general public about UNC's animal lab. And finally, last week, the school contacted us to relay that the animal lab would be ending and that the school would only be using human-relevant methods to train emergency medicine residents! We could not have achieved this without your support. More than 42,000 petitions were sent to top officials at UNC from our members across the United States and around the world! Now, UNC joins the vast majority of its peers by embracing medical simulation as the superior training method.